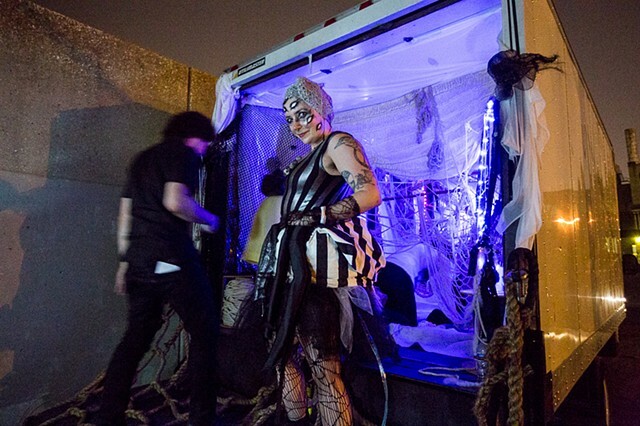 Every Saturday in August 2015, a different city across America hosted a Lost Horizon Night Market: an open source creative platform where artists created interactive experiences inside box trucks showcase them in late night guerilla pop-up exhibitions. Everyhere Logistics was ten teams of artists – six starting from New York and four starting from San Francisco – who traveled cross country to the towns hosting Night Market, bringing their own trucks to share the Lost Horizon experience. Before we were Shadow Traffic we were the Arachnia Patisserie and the Everyhere Logistics Travel Agency. Arachnia Patisserie was a spider's web that wrapped up flies. If you were a good fly, you were fed treats; if you were a bad fly, you got the swatter! EhL Travel Agency was a pop-up travel agency that engaged travelers in the tradition of storytelling and created a marketplace of information.